Let’s face it: Third-party keyboards have left Apple’s iOS keyboard in the dust. Here are our favorite picks. Whether it’s the slim butterfly mechanism of the new MacBook or the bouncy fabric of the Smart Keyboard, the feel and travel of the letters under our fingers has as much impact on our productivity as the speed of the processor and size of the screen. It’s no different on our touchscreen devices, and thanks to third-party developers and iOS’s now-open keyboard API, the iOS typing experience has gone from ordinary to extraordinary. Hundreds of apps all claim to speed up, smarten, and otherwise improve upon Apple’s own QuickType keyboard. For example, the slide typing method pioneered by Swype has transformed not just how but also how much we type. But which ones are the smartest, most comfortable, and best of the bunch? Whether you want to type faster, use one hand, add a funky design, or see more of the screen, you’ll find a multitude of options in the App Store—and even some of Apple’s biggest competitors are getting in on the action. Gboard looks a lot like Apple’s QuickType, but the similarities are only skin deep. 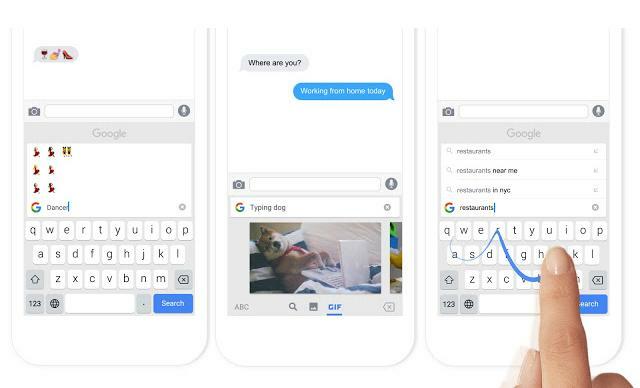 It was fairly inevitable that Google would release an iOS keyboard—Google has long been proliferating the App Store with its many tools and utilities, and keyboards was just about the only piece of the pie it didn’t already have one of its fingers in. What is surprising, however, is how great it is. Google has a history of ignoring the latest APIs and interface guidelines when it comes to its iOS offerings, but Gboard (free, universal) looks and feels right at home on the iPhone. Quite frankly, despite the addition of a multi-colored “G” logo in the left corner (and the use of Android’s Roboto font over San Francisco), you won’t find very many differences at all between it and Apple’s keyboard. The only major change you’re likely to spot being a slightly smaller return button to make room for a permanent period key next to the space bar. 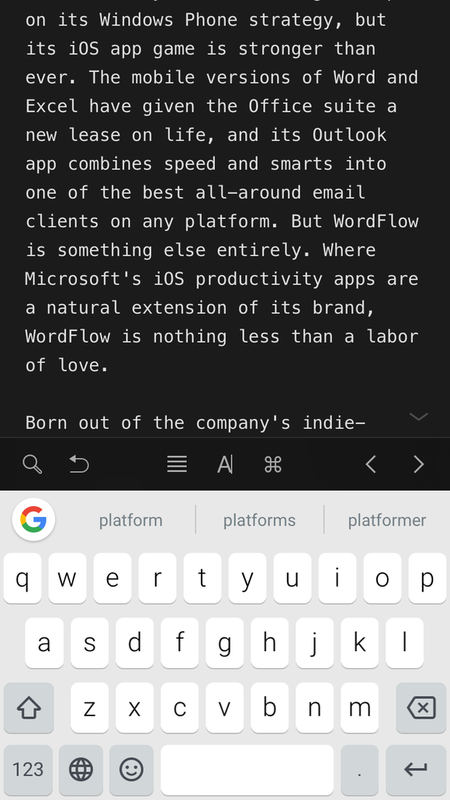 But go a little deeper and Gboard begins to set itself apart from both its competitors in the App Store and Apple’s stock keyboard. Inside the settings you’ll find a set of toggles that gives you a measure of additional control over the keyboard’s operation. Google matches Apple’s options for auto-capitalization, correction, caps lock, character preview, and the “.” shortcut, as well as the show lowercase letters option that Apple hides in the Accessibility tab. And there’s even a switch to block offensive words (which is something you’ll want to turn off if you’re tired of constantly editing the word “ducking”). In-keyboard search results make Gboard unique, but it’s only part of what makes it great. Gboard also offers a toggle for emoji suggestions, but while it’s nice to have the option, it’s unlikely anyone would want to turn it off. Emoji symbols appear as you type and replace the text that was written, a seemingly obvious touch that other keyboards don’t always get right. Tap the emoji symbol at the bottom of the keyboard and you’ll get much more than a scrollable list of faces and figures; in fact, Gboard’s emoji keyboard all but eliminates the need to keep another around. Unless you have a thing for stickers or giant icons, Gboard will more than fit your emoji needs, with excellent organization, speedy navigation, and a powerful search bar that quickly pares down Apple’s sizable library with live results. But this being a Google keyboard, finding things isn’t limited to emoji. 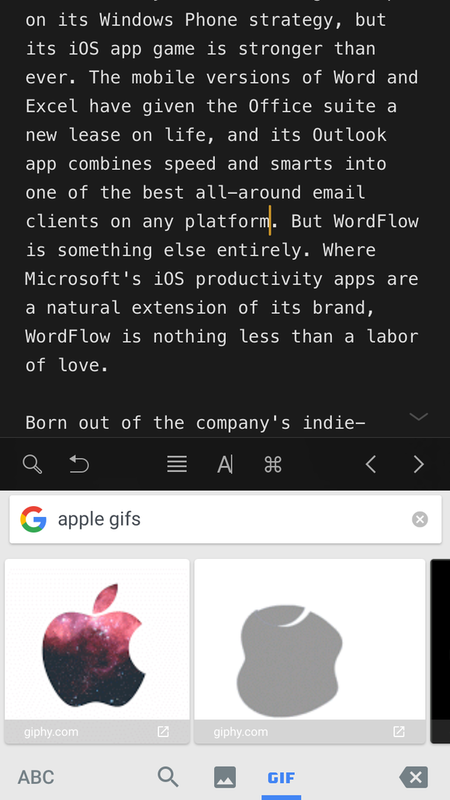 Tap the G symbol and you’ll get a stripped-down web search bar, which lets you paste images, GIFs, and links into whatever you’re typing. It’s a neat feature that comes in handy more than you think—particularly when using Messages or Twitter. Even if you never use it to search the web, Gboard is the best keyboard you’re likely to find. While Google’s version of swipe typing doesn’t really bring anything new to the table, it leverages the power of its excellent dictionary to deliver a top-notch experience that’s as accurate as it is fast. Microsoft may have all but given up on its Windows Phone strategy, but its iOS app game is stronger than ever—and Word Flow (free, iPhone only) is something else entirely. Where Microsoft’s iOS productivity apps are a natural extension of its brand, Word Flow is nothing less than a labor of love. Word Flow’s sense of style adds a bit of elegance to your writing. Born out of the company’s indie-minded Garage lab and built specifically for the iPhone, the slide-centric keyboard hits all the right notes, while still managing to add some originality along the way. Visually, it’s flawless: Letters light up with a subtle blue glow as your fingers glide over them, and when swiping, the path of your words is traced with a playful line of dots that adds just a bit of whimsy. Along with an impressive level of customization (which goes so far as to allow you to underlay the keys with one of your own photos), Word Flow also understands that easy access to emoji is more important to some people than punctuation. Much like the way it handles words, it puts a premium on organization and speed, keeping track of your most recently-used smileys and symbols, and letting you easily jump between sections. And a built-in search from the main keyboard will keep common characters at your fingertips. 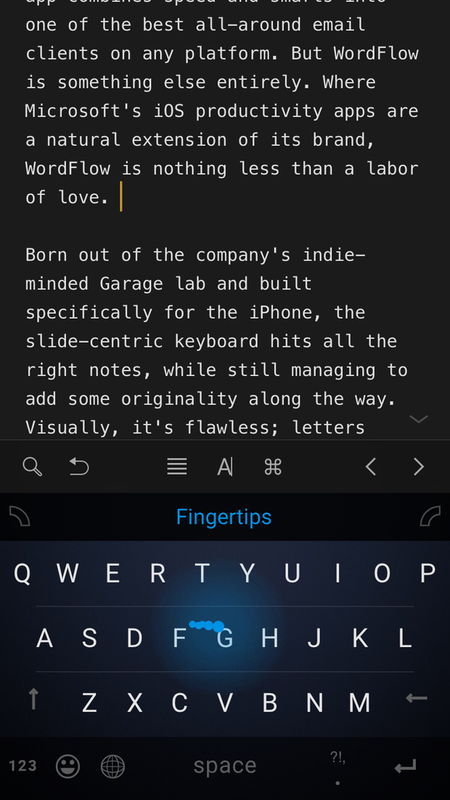 With Word Flow’s one-handed keyboard you’ll feel like you’re using an iPhone SE in a Plus’ clothing. Every keyboard needs a gimmick, but Word Flow’s is one you’re likely to actually use pretty often. Pull down on the small arc symbol in either of the top corners, and the keyboard will transform from a traditional layout into a fanned one meant to encourage one-handed typing. This isn’t a simple shift like Reachability—the curved keyboard repositions the keys for maximum efficiency, allowing your thumb to comfortably reach all the way to the farthest keys. There’s a slight learning curve (no pun intended), but after a few moments you’ll be typing with your usual speed. Microsoft has built a prediction and correction engine that not only rivals Apple—in my experience, it occasionally even bested Google’s Gboard with first-attempt accuracy. Whether tracing or tapping, words are spelled out with near-flawless accuracy, and it does an excellent job of learning your habits as you type. GIFs make the world wide web go round, but finding them and using them can be a pain. With Giphy Keys (free, iPhone only), the whole process is boiled down to just two steps: find and insert. Giphy Keys offers one-stop shopping for GIF fanatics. Most serial giffers are already familiar with GIPHY’s expansive library of memes and moving pictures, but its keyboard puts the whole catalogue at your fingertips, whether you’re composing in Mail or Tweetbot. As an actual keyboard, Giphy Keys leaves quite a bit to be desired, with no slide typing, predictive terms, or even autocorrect, but that’s not its appeal. It’s meant to be a companion to your keyboard of choice, and in that capacity it performs admirably, offering easy access to GIFs with just a couple of taps. A series of shortcuts lets you search, browse trending topics, explore categories, and access your favorite gifs, all in an easy-to-use interface that’s surprisingly speedy despite its cramped quarters. The only problem with it is that it’s so easy to get lost in its results you may forget what you were actually looking for. 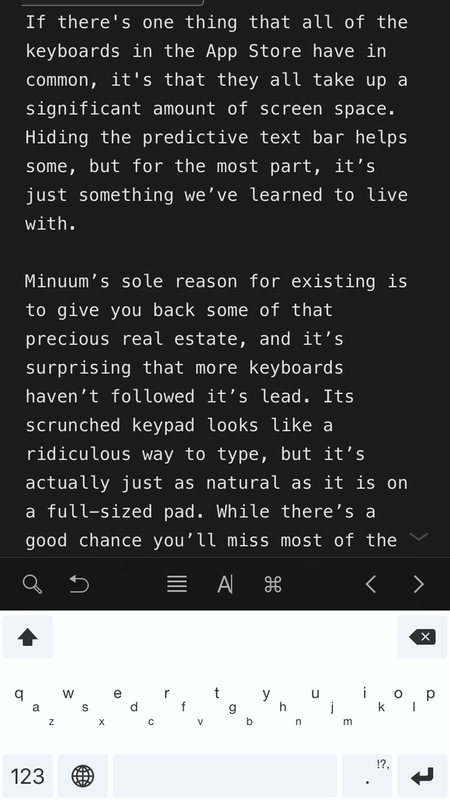 If you want to reclaim your lost screen real estate, give Minuum’s short keyboard a try. If there’s one thing that all of the keyboards in the App Store have in common, it’s that they all take up a significant amount of screen space. 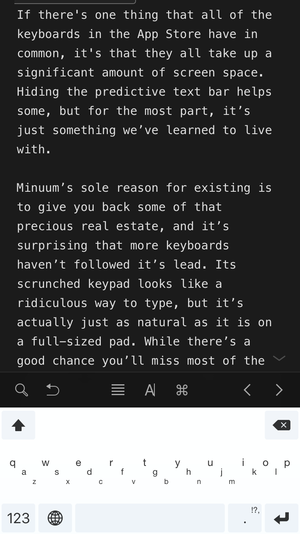 Minuum’s ($4, iPhone only) sole reason for existing is to give you back some of that precious real estate, and it’s surprising that more keyboards haven’t followed its lead. Its scrunched keypad looks like a ridiculous way to type, but it’s actually just as natural as it is on a full-sized pad. While there’s a good chance you’ll miss most of the keys you’re aiming at, Minuum uses an autocorrect engine that does well to mimic the muscle memory of a full-sized keyboard; there’s an impressive accuracy rate, and when it misses, there’s a good chance that one of the five options to correct will be right, cutting down on the amount of times you’ll need to hit the tiny backspace key. There’s no swiping, so you’ll have to tap out your words, but Minuum does use a couple of gestures to make things a little speedier. You can swipe right to insert a space and left to delete. And if you start to get claustrophobic, you don’t need to hit the globe icon to change keyboards—a simple swipe up will expand the keys to normal size. But where’s the fun in that? If you’re looking for customization and swipe typing, go and get Go Keyboard. Go Keyboard’s (free, universal) robust customization options don’t come at the expense of its usability. Even without all the tweaks it lets you make to the appearance, it’s a decent alternative, with stickers, swipe support, and cursor control, as well as Reachability-inspired one-handed mode. But the main reason to install Go Keyboard is its multitude of themes, which can be easily downloaded inside its companion app and changed with just a tap without leaving the keyboard. Themes and color combinations range from tasteful to tacky, but the vast majority of them are free, so you’ll be able to test them and toss them if they’re not to your liking. There’s also a keyboard creator that lets you build the keyboard of your dreams, with sliders and selectors to customize the font, color, picture, and opacity. Like themes, some of the options will cost a buck or two, but there are more than enough free ones to keep the creative juices flowing. There’s a learning curve, but Nintype is the fastest keyboard in the west. Nearly every swipe-based keyboard uses the simple concept Swype originated with its Android app: Trace the letters of the word in a single, continuous motion. Nintype ($5, universal) offers a spin on this traditional swiping method that actually speeds up your tying—assuming you can master its technique. It’s the only keyboard with a tutorial that’s prerequisite to using it, but you shouldn’t let that scare you. 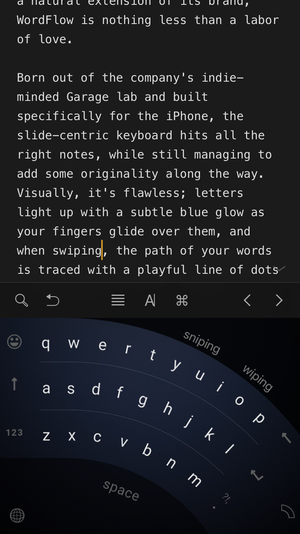 You can use Nintype as a regular swipe or pecking keyboard if you prefer, but you’ll be missing out on one of the most unique keyboard concepts around, a powerful system that combines multi-finger sliding and tapping to create words. There are numerous options for customizing the experience both visually and conceptually—including the ability to adjust the number of milliseconds that elapse before auto-spacing is activated—and a series of gestures streamline functions like backspace and punctuating. There’s even a build-in calculator mode that will perform simple equations. Granted, Nintype’s concept and heavy use of animation might not fit everyone’s tastes (or fingers), but those willing to spend some time learning it will enjoy a noticeable bump in their word output. 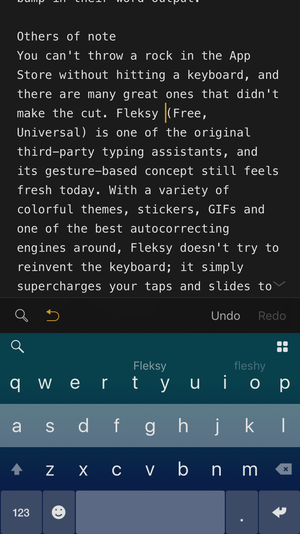 Fleksy’s design may be timeless, but that doesn’t mean it hasn’t kept up with the times. You can’t throw a rock in the App Store without hitting a keyboard, and there are many great ones that didn’t make the cut. 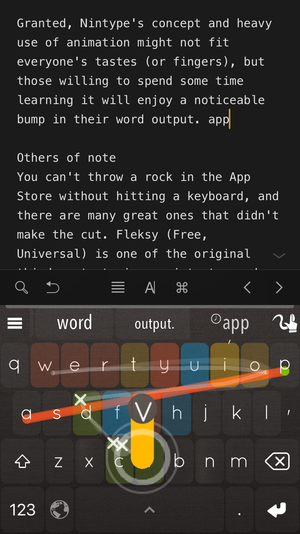 Fleksy (free, universal) was one of the first third-party typing assistants to hit the app store, and its gesture-based concept still feels fresh today. 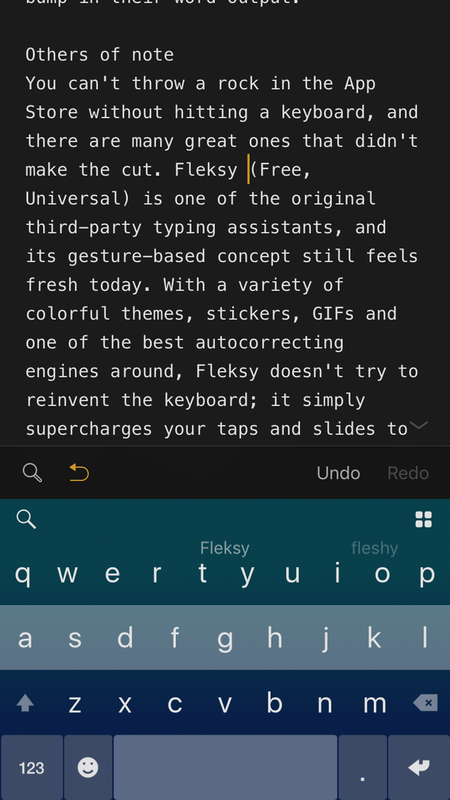 With a variety of colorful themes, stickers, GIFs, and one of the best autocorrecting engines around, Fleksy doesn’t try to reinvent the keyboard: It simply supercharges your taps and slides to speed up your pecking. 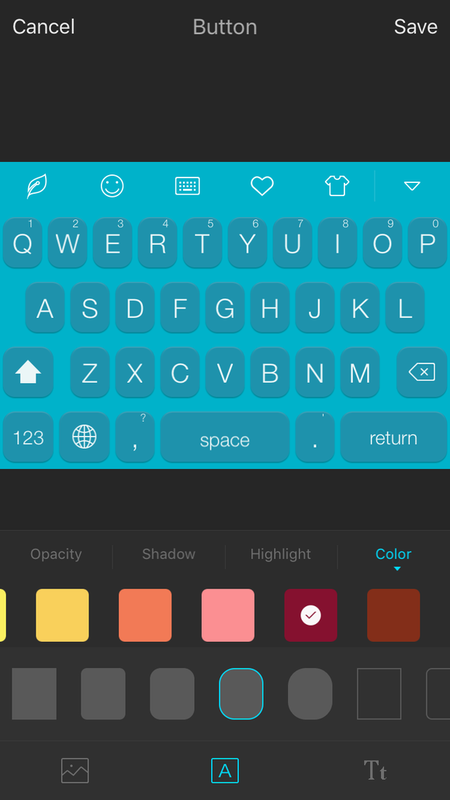 Like Fleksy, SwiftKey (free, universal) has been around since the moment Apple opened up the keyboard section of the App Store, and it’s only gotten better with age. Smart, simple and sleek, the swipe-centric keyboard relies on top-notch predicting and autocorrecting to deliver a superb typing experience. However, Microsoft acquired SwiftKey back in February and has plans to integrate SwiftKey’s powerful learning engine with its Word Flow keyboard, which means we can only expect Microsoft’s keyboard to keep getting better and better. 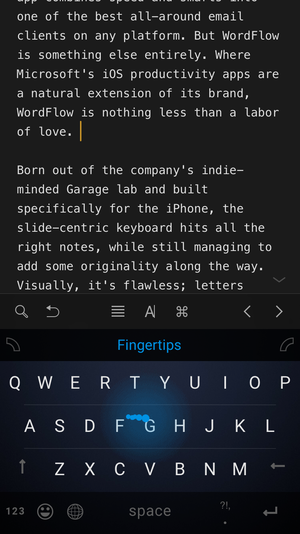 Most custom keyboards offer a variety of ultra-modern designs and futuristic color combinations to dress up your keys, but Hanx Writer (free, universal) tackles personalization a little differently. Created by Tom Hanks—yes, that Tom Hanks—the keyboard mimics the sound and style of a classic typewriter, with several realistic renditions of 1940s-style machines. And if you use the companion app to take notes, you’ll even get old-school typefaces. 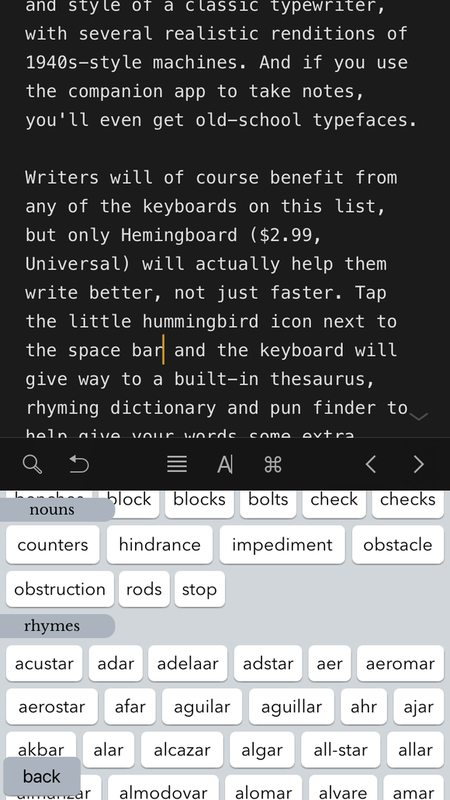 With Hemingboard, the solution to writer’s block is just a tap away. Writers will of course benefit from any of the keyboards on this list, but only Hemingboard ($3, universal) will actually help them write better, not just faster. 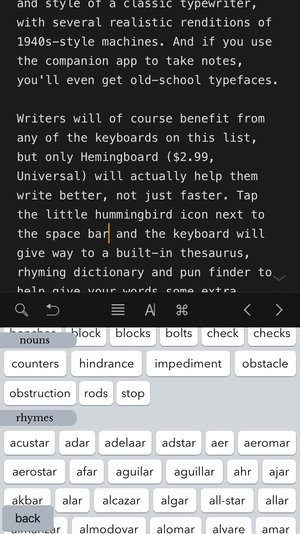 Tap the little hummingbird icon next to the space bar and the keyboard will give way to a built-in thesaurus, rhyming dictionary, and pun finder to help give your words some extra oomph. And if you need to work with several languages, iTranslate (free, universal) will be your perfect lingual companion. With support for some 90 languages, the keyboard packs everything great about the app into a fully functional keyboard that puts a powerful translator right at your fingertips. 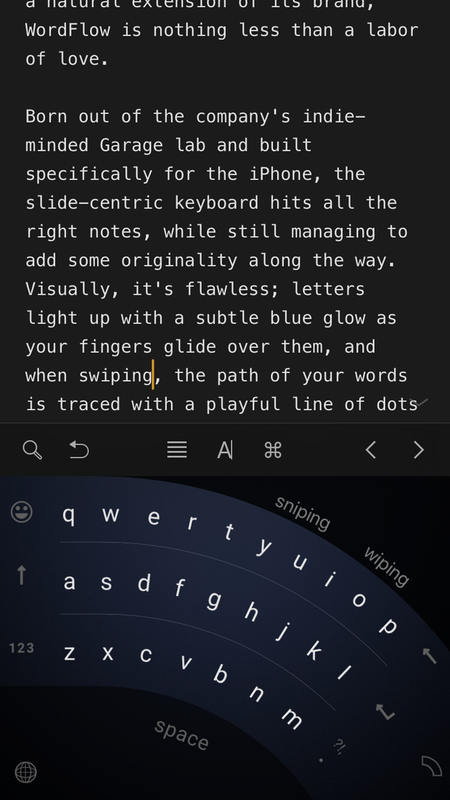 I tested dozens of keyboards for this article, and slide-typing as an option was the one feature that was a must to be considered as a finalist. That beyond said, all sliding keyboards are not created equally. Since Apple doesn’t provide access to its autocorrection algorithm or dictionary, the results vary greatly between models. Even the two winners here, from companies with tremendous resources and lengthy histories of working with type, don’t quite measure up to Apple’s abilities to fix and predict words. But the gap is small enough where they can comfortably be recommended as full-time replacements. There are a couple of caveats to going all-in with a third-party keyboard—many might feel buggy at times, and some are noticeably quicker and load more reliably than others)—but that is due in part to iOS itself, particularly when you have several keyboards installed at once. Often, iOS may not recall the last one you were using, and at times the one trying to launch can hang long enough where quitting the app is the only way to resume typing. To unlock the best features, you’ll generally need to switch on the Allow Full Access toggle. It comes with a scary warning from Apple about your sensitive information being visible to prying eyes, but for the most part, the privacy risks are minimal. Any password or credit card field in an app or browser automatically brings up Apple’s secure keyboard (even if it’s been removed), and developers are mostly pretty transparent about how they’re using your data.